We’re looking forward to seeing everyone at the convention tomorrow! Here’s a bit of info to help make your parking and registration go more smoothly, especially for those of you who are joining us for the first time. For anyone arriving before 4:30pm on Friday, parking in the ACC parking lot will be limited to 50 spots that will be marked out with signage by the college. 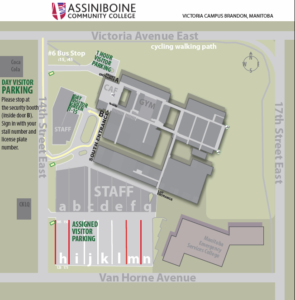 We don’t know where exactly those spots will be, but they should be in the general vicinity of the area marked “Assigned Visitor Parking” on the map below. Once those spots are full on Friday, any additional cars will have to park in the empty lot on the west side of 14th Street East. After 4:30pm Friday and all day Saturday and Sunday, attendees are free to park anywhere in the ACC parking lot. A copy of the next map will be in your tote bag when you register. 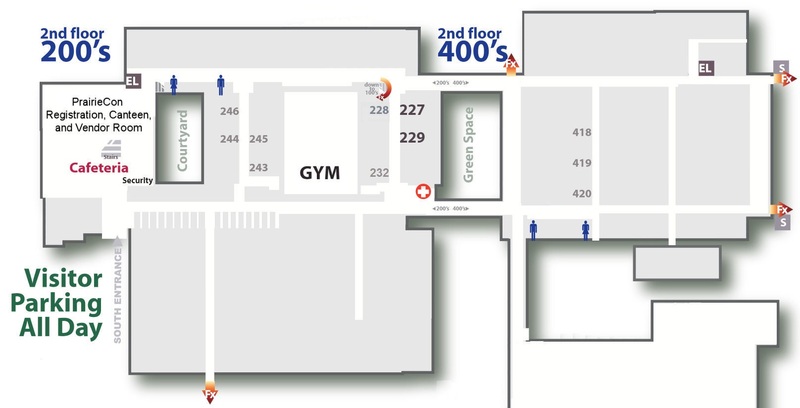 This shows the main floor, where you’ll find all of our PrairieCon events. Well technically the gym is down a flight of stairs, but everything else is on one level. When you arrive at ACC, your first stop should be our registration desk. 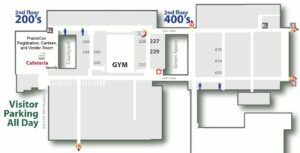 It’s located in the gym on Friday afternoon until about 3:30pm, but after that it will be found in the cafeteria for Friday evening and the rest of the weekend. If you’re a smoker, please respect that the only places ACC allows smoking is in the smoking areas outside the doors marked with a white “S” on a grey square on the map. All content is ©copyright to Prairiecon.